At Mint Dentistry, we strive to make each and every visit a pleasant one for all our patients. Please take the time to read a number of reviews left for our dental practice and dentists. The front desk office assistants are so amazing to work with. The atmosphere at Mint was so welcoming, I felt like I was with family. The doctors were great and explained everything so clearly so I could make a good decision about my teeth! I'm so glad I found this place. Dr. Molayem took me as soon as they could the morning I called with a broken tooth. They are gracious and understanding and I walked out if their office within hours with a set of teeth you'd never know had been damaged. I am equally impressed with their warm demeanor as their talent. I am now a client for good. I'm going to start this review by saying that I'm terrified of needles and pain. Like really well and truly terrified. I cry when I pull splinters out of my toe. Anyways, you should be able to understand why I'm not fond of dentists - big needles and drills are not my thing. I told my dentist - Dr. Arash Molayem - about this and he was surprisingly cool about it. Did a really great job of keeping me calm while he was numbing me, and when I did start crying he was very cool about it. His combination of friendly calm and professionalism is fantastic. When he came back after I was numb, he set up a system so I can tell him anything I needed - pain, too much water, craving a coke - and it was cute, and it actually worked. I realized something too - I've been too a lot of dentists, and they all talk to you, and ask what school you're in, or what you're doing over the summer, or what your job is like, and every question demands an answer, which is impossible because your mouth is full of metal and water and plastic. Dr. Molayem would say little things that didn't require a response, and he would keep me updated on what was going on, which was great. My wariness slowly dissipated. I've honestly never had a dentist I like more - and I've had a lot. He never made me feel ignorant for asking questions about pain, or my bite, or being terrified. I don't think I'll be crying the next time I go to fill the endless number of cavities I seem to have. Dr. Molayem took on my case when I had only seven teeth left in my head and they were all in poor shape and on the lower jaw. I looked like a cross between Gabby Hayes and Andy Gump. He put together a great team and woked with me for a nine month period. I currently have 15 additional teeth in my head and a seriously great smile. I'm getting a lot more work, making more sales, dating, and most of all my children are no longer embarrassed to be seen with me. I owe him big time! We ask that you take a moment of your time to review our dental practice, letting those who may be unsure that Mint Dentistry is the right dentist for them. Let people know how Dentists Shervin Molayem, D.D.S. & Arash Molayem, D.M.D. and their staff helped you get the bright and beautiful smile you always wanted. If you have a Google account, please sign in. You will be directed to our review site. If you don't have a Google account, but would like to write a review, please create a Google account. 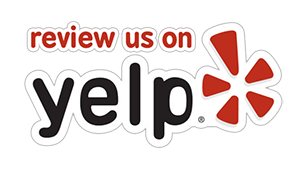 Please click the button below to review our practice on Yelp.